Early this week my friend Kerry Eddy, of Tom Eddy Wines, invited me to The Wine Sensory Experience in Calistoga to take the scent challenge offered in their wine education classes. Dare I take a test in which I go head to head with an experienced winemaker? Heck yeah! Bring it on. The Wine Sensory Experience is not as science fair or Exploratorium-esque as it sounds. It’s actually one part wine education, one part tasting room, and one part gift shop. T’Anne Butcher, who has been involved in her families wine business (W.H. Smith Wines) for over 30 years, decided to open The Wine Sensory Experience to give groups a casual and fun way to learn the basics of scents and aromas that can be detected in wine. This is something I’ve always been curious about and I have even toyed with buying one of those scent vial test kits to hone my olfactory skills. 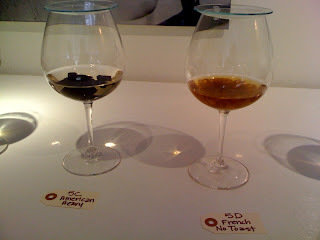 Here’s how it works: Five to six opaque glasses with glass lids are set up and arranged according to aroma types such as Fruit, Pinot Noir, Herbal, or Barrel scents. Then you sniff each glass and try to guess what it is. This is NOT EASY!! You are provided with a clipboard and test sheet that lists each flight of scents with blanks where you write in your response. With our pens at the ready, we began the test. Kerry started with the Barrel scents while I tried the Fruit Aromas. We then moved around the stations recording our answers until we had completed them all. Afterwards T’Anne gave us the answers. I correctly guessed the blackberry, liquorice and bacon fat scents, and All Spice too. I flubbed apricot, mistaking it for strawberry and also mistook vanilla for coconut. I was completely stumped by scent # 5 on the Pinot Aromas even though I absolutely knew it was a familiar scent. I guessed celery root and then wrote down cabbage as a base note. The answer? Wasabi- or more commonly known as Horseradish! Another revelation was the scent I considered to be distinctly “barnyard” was actually white pepper. But as soon as T'Anne mentioned it was white pepper, I could suddenly smell it. It’s like those negative space puzzles where you stare at an image and only see a face and then, once it’s pointed out, you see a goblet or different object altogether. I was amazed how such a simple exercise opened up my eyes, not to mention my nasal passages to the dynamics of scent. Also I was happy to learn that my recent Lambrusco mishap did not permanently damage my sense of smell as I had feared. The next exercise involved Barrel Component samples that allowed you to see and smell how barrels play a part in the flavor profiles of wine and the differences in American and French oak barrels that had been toasted. The heavy toasted samples looked black and charred like charcoal briquettes, but they were the least oak smelling. I loved the scent of the no toast French oak and was surprised how delicate it was compared to the medium toasted American oak. After the scent tests we tasted some of W.H. Smith wines and I felt like I was sniffing wine for the very first time. 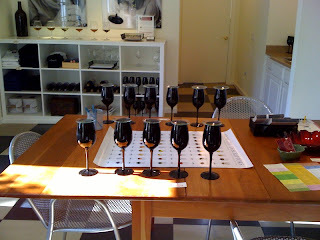 Once our sensory experience was done, and the tasting completed, it was time for some very serious business-- shopping! T'Anne carries a clever selection of wine and non wine merchandise and I came away with the door mat in the photo below that parodies location maps that state “You are here”. 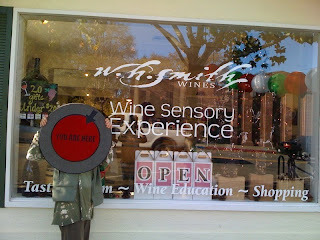 The Wine Sensory Experience was exactly that-- an experience. It was fascinating, intriguing and challenging. I now find myself taking sniffs of everything at the market and I try to associate the smell and aroma to a mental trigger so I can identify the scent again when I taste wine. T’Anne changes up the scents according to the season so you could go through the experience several times and not be presented with the same aromas. I plan on going again in January when my sister is in town. I think this would be a great prelude to a day of tasting or even just a fun outing on it’s own. Private groups of 6 or more can be arranged and T’Anne mentioned that she had just booked a session for a group of executives from Goggle. So maybe sensory exercises are the next big thing for off–site team building. It sure beats the heck out of the ropes courses that were all the rage in the past. I mean really, I don’t need to jump off a tower to test the trust of my peers thank you very much. I think a team building exercise at The Wine Sensory Experience would be far more stimulating and creative than one that includes the possibility of falling to one’s death. I absolutely want to do that! I have a professional background in aromatherapy, but haven't yet gone to any wine classes like that. Thanks for sharing it.